Under Overall Grades, you have the ability to view students’ overall grades. Depending on your settings, you (and your students) can see the current grade-to-date based on graded and released assessments only, or you can see the overall current grade based on the total possible points for the entire course. 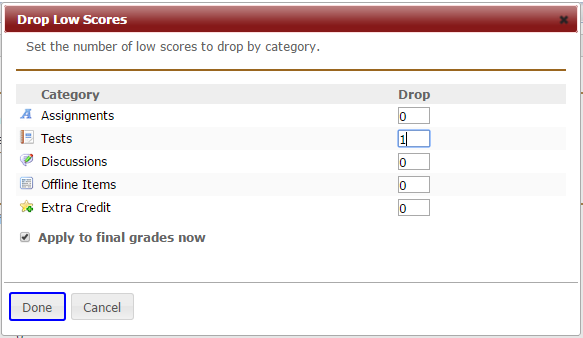 The default view displays the students’ current overall grades based on graded and released items only. During the term, you should have the setting under Grade Options set to “Released assessments only.” This way, students will see how they are doing based on the graded and released work only. Non-submissions of closed assessments are treated as 0’s in gradebook, even when the setting is ‘released assessments only’. This means that you don’t have to assign 0’s to non-submissions manually in assignments, tests or discussions. If an assessment is closed, Etudes will treat non-submissions as 0’s when calculating the grade-to-date for each student. You can assign 0’s in AT&S or Discussions for non-submissions, if you want, but it is not required to show an accurate grade-to-date in the gradebook. Another strategy is to check “All assessments” (under Grade Options >> Grade Display) from the start of the term, but choose to not show a letter grade. At the end of the term, go to Grade Options and select “All Assessments” under Grade Display. This setting will take into consideration all assessments when calculating the overall grade. The system will include non-graded and non-released submissions, too, in the grade calculation. You do not have to award 0’s to students who missed work in order for the overall grade to include non-submissions. They will be treated as zeros automatically! You can override a student’s overall grade by entering an adjusted letter grade in the Grade Override field. Remember to save! The grade booster feature is available to help you adjust border-line grades quickly. This is typically performed at the end of the term, after everything has been graded. To boost the students’ grade, enter a value, select whether to adjust it by points or percentage points, and click on Apply. The students’ overall grade will be adjusted accordingly. To export the students’ overall grades, click on Export to CSV. If you want to export the final grades for just one section, select it and then click on Export to CSV.